It's been a long time since I've talked about comics in this space. I've still been a regular reader for decades, of course, and my tastes fluctuate over time. At the moment, I've been reading practically NO DC books, an unhealthy amount of Marvel, and a lot of Indies. 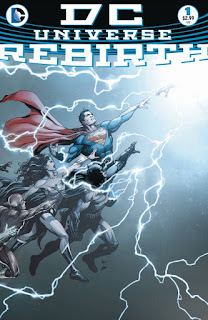 So when DC launched a new "reboot"/"relaunch"/"retry" I decided to take a look. I had been drifting away from DC for years, but things really pitched off a cliff with two recent initiatives - Flashpoint and the New 52. Their brilliant idea was to end the current universe and then rebuild it. New stories! New challenges! New customers! The truth of the matter is that this trick rarely works. Inevitably the inertia of both creatives and fans brings things back to a supposed "normal". For me, this New 52 approach resulted in a lot of characters that were suddenly strangers, and I moved on. That's OK. I have way too many longboxes of the old stories downstairs. Wally West (once Kid Flash, once Flash) has been in exile outside the current universe, in the speed force (the source of the Flash's superhuman speed). He manifests back in the current universe, re-appearing to Batman, who doesn't recognize him. Wally bounces through the universe, trying to find someone who remembers him in this strange new universe. He despairs. Finally Wally appears to Barry Allen, the once and current Flash, who recognizes Wally and keeps him from being fully absorbed by the speed force. Wally explains that someone else is responsible for the strangeness of the New 52. Meanwhile, back in the batcave, Batman finds the iconic, blood-smeared smile button from the Watchman series. In an epilogue, we get quoted lines from Watchman indicating that Dr. Manhattan, a godlike being, may be responsible. Anyway, that's pretty heavy stuff - the universe is, if not broken, definitely sprained. And the one responsible is from a popular comic series from another DC property that is now part of the DC Universe (maybe). This is a launch book, so it poses more questions that it answers. As Wally bounces through time, we get teases for all sorts of stuff that will hopefully be paid off in future parts of the universe. The JSA may come back. Maybe the Legion of the Superheroes. The current Superman is dead (talk about burying your lede) but there is a secret Superman from another universe running around. There are three Jokers running around. The current Robin turns 13. Some guy stares at a fish tank (OK, you got me on that one. No idea what that means). Normally such scattershot vignettes are frustrating and smack of plugs for other books, but by grounding it in Wally's story, they pull them all together under the general category of "something is amiss". And Wally's story is what's important here - returning him to the universe, challenging him, bringing him to brink of failure, forcing acceptance of his fate, then bringing him back with hope. Yeah, that's the sort of spirit I miss. Wally's Flash was a favorite of mine, much more so than the Barry Allen Flash I grew up with. It is good to have him back. One thing of interest in all this. We get a LOT of backstory on Wally here, which makes sense given that he may be a forgotten figure for a lot of fans who have shown up in the past few years. His entire backstory (and that of the DC Universe from the Silver Age to introduction of the New 52) is laid out. 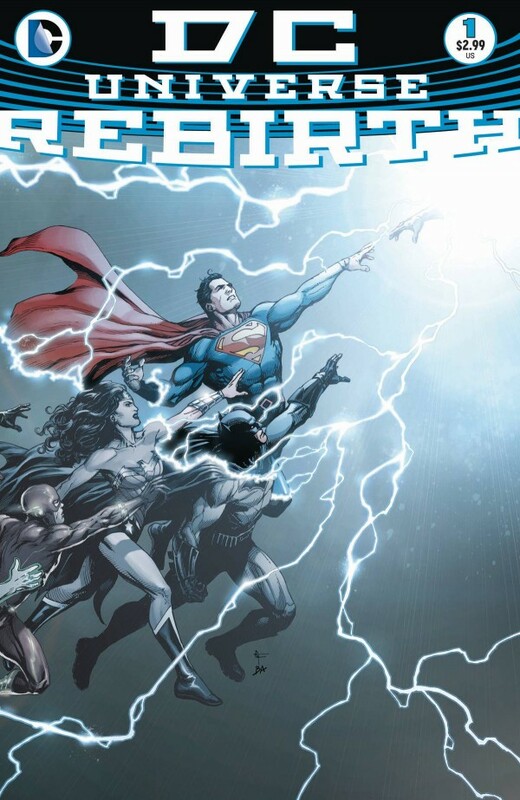 But the final tease, laying the responsibility on the doorstep of Dr. Manhattan, relies on not only knowing the unseen Dr. Manhattan character (telekinetic, fascination with watches,lives on Mars), but in knowing lines from the final issue of that book. Two other small things that I haven't noticed being mentioned elsewhere that happen in this book. 1. Hands. DC has a thing with the hand as a symbol of creation. The origin story of the universe for many incarnations involved a hand (that of god) coming out of nothing, creating the universe. The DC Universe's big bang. Check the cover (above) to see a hand coming out of the lightning. we see another hand, reaching out as a threat, with the assumption that it's Dr. Manhattan. 2. Watches. The story opens with a broken watch (Wally's), and closes with the watch being repaired (telekinetically) on Mars. The thing is, after the watch is repaired, it runs backwards. Don't know if that's a thing, but it seems pretty major, and not a lot of people have noticed. So now this "soft reboot" and so far doesn't change what has happened in the most recent, "New 52" universe, but it does try to re-steer the tone and conversation of the universe, and bring it back towards a more comfortable, positive edition. The story is solid, even if it has more hooks that a fisherman's tackle-box. It writes a lot of checks, and now challenges the rest of the line to see it they cover them.